At Cape Canaveral Air Force Station's Launch Complex 41 in Florida, a United Launch Alliance Atlas 5 rocket with NASA's Tracking and Data Relay Satellite, or TDRS-L, spacecraft atop, arrives at the launch pad for a planned Jan. 23, 2014 launch. CAPE CANAVERAL, Fla. — A fresh satellite for NASA's communications network is set for launch from Florida's Space Coast on Thursday (Jan. 23) to bolster voice and data links between mission control, the International Space Station and a fleet of orbiting research observatories. The 3.8-ton spacecraft is scheduled to lift off aboard an Atlas 5 rocket at 9:05 p.m. EST Thursday (0205 GMT Friday) from Cape Canaveral's Complex 41 launch pad. The launch window extends for 40 minutes. You can watch the NASA launch live online here beginning at 6:30 p.m. EST (2330 GMT), courtesy of NASA. Members of the news media are given an opportunity for an up-close look at the TDRS-L spacecraft undergoing preflight processing inside the Astrotech payload processing facility in Titusville ahead of the satellite's January 2014 launch. NASA developed the tracking system to replace an array of ground stations that provided intermittent communications coverage for a fraction of a space mission. Without TDRS, officials say the space station and NASA's most prolific satellites in Earth orbit would be left without a way to get data back on the ground at the speeds scientists have become accustomed to in the last few decades. "No human spaceflight program can be supported at this data rate, and our ability to respond in real time to emergencies would be diminished drastically," said Badri Younes, NASA's deputy associate administrator for space communications and navigation. "That's why TDRS has been declared a national asset, not only because of the capabilities up there but our ability to reach any point on Earth at any time." "The Atlas 5 rocket and range equipment are ready, and the combined government and contractor team is prepared," said Tim Dunn, NASA's launch director for the mission. "We're all excited to launch this critical national asset, the TDRS L satellite." See how NASA's TDRS-K and L satellite work with the agency's Tracking and Data Relay Satellites constellation to provide continuous contact with spacecraft orbiting Earth. See the full SPACE.com Infographic here. TDRS L is the second satellite in NASA's newest series of data relay platforms, joining an identical spacecraft launched in January 2013 and already in service. According to NASA, the two satellites and associated upgrades to the TDRS ground station at White Sands, N.M., cost approximately $715 million. NASA has one more TDRS satellite under construction for launch when needed. Jeffrey Gramling, NASA's TDRS L project manager, said engineers will likely put the new satellite in standby to be introduced into the operational constellation when an older craft is retired. Younes said he expects TDRS L will be put into operation before 2020. It will take an hour and 46 minutes for the Atlas 5 rocket to deposit TDRS L into an oval-shaped orbit ranging between 3,006 miles and 22,237 miles (4,838 and 35,787 kilometers) in altitude with an inclination of 25.5 degrees. The launcher's first stage, powered by a dual-chamber RD-180 engine built in Russia, will fire four minutes to boost the rocket into the rarified upper atmosphere. The Atlas 5's hydrogen-fueled Centaur upper stage will ignite its RL10 engine a few seconds later for the first of two firings on Thursday night's mission. The first Centaur burn will last about 18 minutes, followed by a coast through space before the RL10 engine fires again for a 63-second burn set to begin at 10:45 p.m. EST if the launch occurs on time. The separation of TDRS L is expected at 10:51 p.m. EST, assuming an on-time liftoff Thursday night. The fuel-laden satellite is programmed to switch on its radio transmitters and broadcast its status to a ground station in Australia moments after deploying from the Centaur upper stage. TDRS L's on-board maneuvering engine will ignite five times over the next 10 days to reach a circular orbit 22,300 miles (35,888 km) high, the altitude where a satellite's orbit synchronizes with the speed of Earth's rotation. Then the spacecraft will unfurl its antennas and extend two solar array wings before beginning about three months of testing to check the satellite's functionality. Handover to NASA is expected around May, according to Gramling. From its vantage point high above the equator, TDRS L will mechanically pivot twin 15-foot-diameter (4.6 meters) mesh reflectors to track the space station and other satellites orbiting a few hundred miles over the planet, beaming messages back and forth in S-band, Ku-band and Ka-band frequencies. "The TDRS satellites must track an object 22,000 miles away that is moving across the face of the Earth roughly every 45 minutes," said Andy Kopito, director of civil space programs and Boeing Space and Intelligence Systems. "This capability is analagous to standing at the top of the Empire State Building and tracking an ant as it marches its way down the sidewalk in front of the building, a truly remarkable capability." Like its TDRS counterpart launched last year, TDRS L is a multitasker with the ability to communicate with several satellites at different frequencies at the same time. Despite the space shuttle's retirement, the number of TDRS users has gone up in recent years, said Robert Buchanan, NASA's deputy TDRS project manager. Thanks to the TDRS network, NASA can beam live video and audio to and from the space station. And if you've seen any of the breathtaking cosmic images from Hubble, chances are they made it to Earth through TDRS antennas. NOAA weather satellites in polar orbit, NASA's Terra, Aqua and Aura climate research satellites, and launch vehicles rely on the TDRS network for communications. 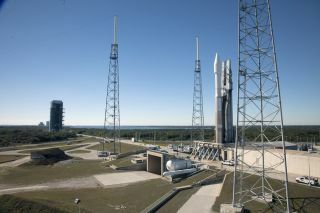 The Atlas 5 rocket launching TDRS L carries a transponder to send telemetry back to the launch team via the TDRS system. Vernon Thorp, United Launch Alliance's program manager for NASA missions, said availability of TDRS communications has allowed engineers to design more flexible launch trajectories and save money by eliminating staffing of downrange ground stations. "I think it's a great testament to the breadth of valuable services that the overall TDRS constellation provides," Thorp said. The spacecraft will be renamed TDRS 12 once it enters service. Editor's Note: Visit SPACE.com for launch webcast coverage of the TDRS L launch. You can also follow the launch with with SPACE.com partner Spaceflight Now via its Mission Status Center here.